“DON’T MAKE EYE CONTACT!” my fishing buddy shouted from a distance upstream. An important reminder as I stared into the eyes of the advancing 10-foot brown bear that had quietly floated downstream to just a few feet from the tip of my fly rod. 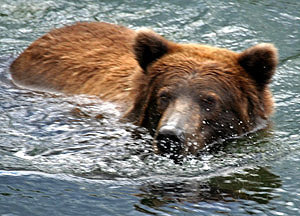 As I quickly shuffled backwards in knee-deep water, I heard my friend’s second caution, “And don’t run!” Both are valuable tips from the park rangers at Katmai National Park. Thankfully, the bear must have attended the same orientation, for as I shifted my gaze and slowed my retreat, he continued drifting past me down the river. This heart-pounding bear encounter was just the sort of experience that made my time in Alaska so unforgettable. So if you love the wilderness and nature … think Alaska. Or if you just want to get away from the noisy hustle and bustle of everyday … think Alaska. 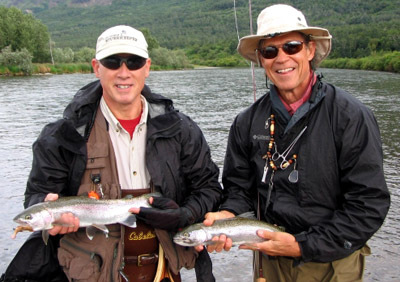 Or if you’re an avid angler and want to find some of the best trout and salmon fishing in the world … then think Alaska. I had been thinking Alaska for some time before my good fishing buddy and I spent 10 days at Brooks Lodge, nestled deep in the heart of the Katmai National Park and Preserve. For some, Katmai is a bit remote. It’s something you definitely feel as you head out on your two-hour flight from Anchorage to King Salmon and then by float plane to the Kenai Peninsula where our lodge was located. And yet it seemed that we were there in no time. Once we landed, we were quickly whisked away to the lodge, where we checked in, unpacked our gear, and attended a brief, mandatory orientation on how to deal with the local bears (required of all newcomers). As soon as class broke, we were knee-deep in waders, sloshing down the Brooks River with our first guide. It only took two casts of my fly rod before I found myself hooked into a five-pound rainbow trout. Bite after bite, the excitement continued as we caught and released a seemingly endless array of spotted rainbows and blood-red-colored sockeye salmon. Yes, we had found an angler’s paradise. We fished tirelessly from dawn to dusk every day, pulling literally hundreds of sockeye salmon, rainbow trout, and arctic char. All fish are released and conservation is carefully practiced, with a fly-fishing-only policy on the Brooks River. Some spinning tackle can be used on the adjoining Naknek Lake and nearby waters. Guides are available for the less experienced angler and fly-outs with float planes can be booked for trips to nearby spots, weather permitting. For variety of fish and scenery, I would highly recommend the fly-out trips. If you go, you’ll definitely want to bring your camera as brown bears are frequently viewed from the three viewing platforms. Given the required five-foot distance from the bears, packing a telephoto lens (e.g., 200mm or better) is recommended. Also, a day trip is available to visit the volcanic “Valley of 10,000 Smokes” just a short drive away. Brooks Lodge offers a family-friendly environment but would be best for families with children over six, who might better appreciate what the Lodge and area have to offer. Accommodations are basic—the cabins are small and cozy but not for those looking for luxury or privacy. Dining is tasty and filling buffet-style food. You’ll also find a bar and a large circular stone fireplace often burning in the mess hall. 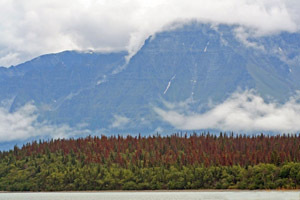 Great food, breathtaking scenery, long days, limitless fishing opportunities with the option to fly out to nearby lakes and rivers, frequent bear sightings, and attentive staff all make for an Alaskan adventure that would be perfect for the hard-core angler, nature lover or travel enthusiast. Home again, I must confess … I’m still thinking Alaska. About the Author: Gary Buffone is an author and photographer who enjoys traveling the world and writing about his experiences. He has published three books and over 30 articles and is a frequent contributor to travel magazines and general publications. Gary is a member of the International Travel Writers and Photographers Alliance and his photographic work can be viewed at www.gbuffonephotography.com.